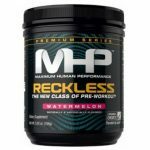 The price on the MHP Reckless (30 serv) drop from $23.99 to $13.99 at Muscle and Strength. Shipping adds $5.89 (free on order $99). The now hard to find, AREZ God of the Gym for $39.99 and free shipping. All flavor.